Recently, I was approached by Andrea Brambila, the Associate Editor of Inman News, about how we are dealing with declining real estate inventory. For those of you who have not heard of Inman News, they are a real estate reporting agency that monitors the US housing market. I have been identified by Inman (in the past) as their source for information on local housing and now the declining real estate inventory in Tallahassee. 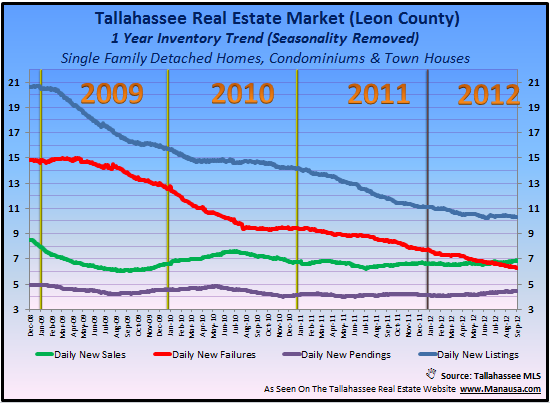 The real estate graph below is a snapshot of the key one-year trends in Tallahassee housing, and the blue line is going to be very important to the question of the source of declining real estate inventory in Tallahassee. In order to get a grasp on the declining real estate inventory in most US housing markets, Inman news has asked the following questions from real estate brokers around the Country. Why do you think inventory in your market is declining? - This is a topic that we have covered often in the past, and it is due to the fact that the majority of discretionary home sellers have given up on the market and are awaiting the return of higher home values. The graph above shows that even though we are near a historical low for home sales, fewer and fewer sellers are entering the market each year. The one positive trend in the declining real estate inventory is that failures are finally fewer than successful home sellers. How are you coping - We are only dealing with home sellers who are motivated to sell a home right now. Those that want to "test the market" end up unhappy with their real estate company, and we do not wish to be that company. We have altered our listing presentation significantly, now offering home sellers the kind of information they really need to make an informed decision. We have found that many home sellers, once educated, make the decision to stay out of the market (thus reducing inventory and making it easier for those that do need to sell immediately). How are your buyers coping? Buyers are doing quite well. The declining real estate inventory has not brought about market equilibrium yet, so buyers still have plenty of choices. Currently, there exists just over 10 months supply of homes for sale in Tallahassee. What do your sellers think of the inventory shortage? - Again, with 11 months of supply, there is no shortage. We consider 5 to 6 months of supply to be a balanced market, so the fact that inventory has dropped from 18 months of supply to 11 months of supply have any real impact on the market? Are prices in your area increasing? if so, what was the median home price in your market in July or August and how does it compare to a year ago? Please list your source (i.e. your local MLS) - This question and the next makes me believe you are correlating rising prices with rising values. Please check the recent article where I show this is an invalid assumption and should be researched in each market. In Tallahassee, we see both average sales prices and home values dropping right now, but there was a time last year when average sales prices were rising, while property values continued to decline. Do you know of prospective sellers that are holding back from listing because they're hoping prices will rise further? Absolutely. I have been advising them since 2008 that the wait will not just be a few years, rather it will be a much longer time frame (2018 to 2021 will bring home values back to 2008 levels). What do you think it will take to bring more inventory into the market? - Ignorance of the shadow inventory and forgotten inventory. Other markets might be truly low on inventory, but Tallahassee is not in that situation. So the real answer to this question is "time." If you want to stay current on supply and demand in the Tallahassee real estate market, you should bookmark this link to the monthly Tallahassee Housing Report. Each month, we provide detailed supply and demand data for each area and each price range in Tallahassee. If you want to know what you should do regarding your own home in light of the current trend of declining real estate inventory in Tallahassee, just drop me a note and we can schedule a time to discuss your specific situation. Pretty soon we will have more buyers than inventory and the market will soon switch. So many builders quit building and now we are rushing to catch up. I'm jealous of your market in WA Betty! We won't have that problem here for many more years unfortunately. There are a few developments that are JUST NOW starting to get back on the ball and build rapidly! But for about 2 years it was nothing. Homes here in Tucson are still not anywhere near where they were just 7-8 years ago. But short sales are up while foreclosures are down, this is good in that I think sellers are simply becoming more educated on their options. Buyers like well-maintained short sales.